It’s not exactly a rivalry, but there is definite familiarity. 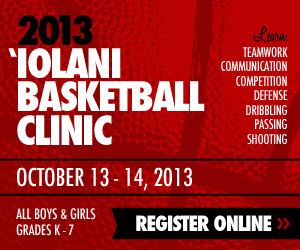 For the sixth consecutive year, the University of Hawai’i will host “brother school” Hawai’i-Hilo at the Stan Sheriff Center. This year’s edition is set for Saturday, December 8, at 7:00 p.m. Tickets are available at the Sheriff Center, or online at www.hawaiiathletics.com. It will be televised live on Spectrum Sports. The Rainbow Warriors are 4-4, and have had a week to recover from a 10-day, four-game road trip to California. That trip started with an upset win over Utah, then ended with three consecutive losses against quality opponents – Seton Hall, Fresno State and UCLA. The NCAA Division II Vulcans are 3-3 after a 72-57 home win over Fresno Pacific on Monday. It is worth noting that the final result and statistics will count as an official contest for the Warriors, but it is a non-counting exhibition game for the Vulcans. 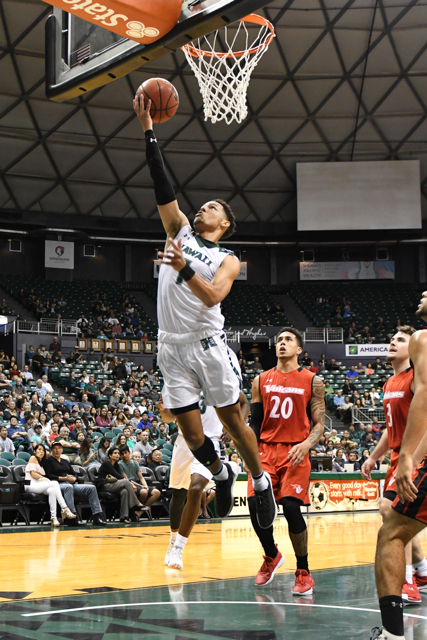 Hawai’i is 9-0 all-time against UH-Hilo, and the last five wins in five years at the Sheriff Center have been by an average margin of 27.4 points per game. In addition to the history of success in the series, the Warriors will bring a distinct size advantage on Saturday. Hawai’i has five players listed at 6-foot-8 and taller: 6-8 Zigmars Raimo, 6-9 Jack Purchase, 7-foot Dawson Carper, 7-foot Mate Colina and 7-foot Owen Hulland. All five should get playing time on Saturday. In contrast, UH-Hilo’s tallest players are 6-8 senior Denhyme Brooke and 6-8 freshman Tom Power. Brooke, who usually gets the start at center, is averaging 7.7 points and 2.3 rebounds per game. Power is a lightly-used reserve player who has yet to score a point this season. In essence, the Vulcans have only one true “big” player in the 6-8 Brooke. Purchase leads the Warriors in scoring at 12.1 per game, and also contributes 5.3 rebounds per game. He is second on the team with 22 3-pointers made. Raimo leads the team in rebounding (6.1 per game) and field goal percentage (.611), and is averaging 9.5 points per game. The better matchups will be on the perimeter. Hawai’i’s rotation of guards includes 5-9 Brocke Stepteau, 6-3 Drew Buggs, 6-3 Sheriff Drammeh and 6-3 Eddie Stansberry. Stansberry is averaging 11.0 points per game and leads the team with 23 3-pointers. Stepteau is averaging 11.0 points and 3.1 assists per game; Buggs is averaging 7.3 points, 5.1 assists and 3.8 rebounds per game; Drammeh is averaging 7.2 points and 3.6 rebounds per game. 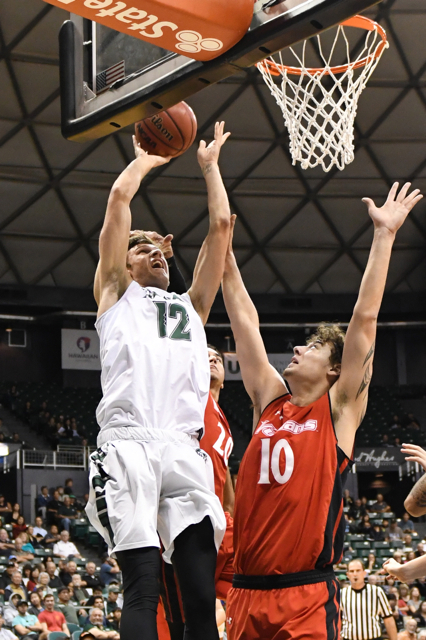 UH-Hilo is led by a pair of senior transfers. James Griffin, a 6-5 guard/forward, is averaging 17.3 points and 5.5 rebounds per game, and leads the team with 16 3-pointers. He is originally from Australia, played with Division I Marist as a freshman, then transferred to West Liberty for two seasons, and then to UH-Hilo prior to this season. Larry Bush, a 6-2 guard, is averaging 12.0 points and 3.2 rebounds per game. He is a transfer from UNLV. Kupa’a Harrison, a 6-5 junior forward, is averaging 5.5 points per game and leads the team with 5.7 rebounds per game. He is a 2015 graduate of Kalaheo High School. Fellow 2015 Kalaheo graduate Kaleb Gilmore is also on the UH-Hilo roster. The 6-foot junior is averaging 4.0 points per game as a reserve. He was at Chaminade as a freshman. Following Saturday’s game, the Warriors will have another full week off before playing Mississippi Valley State on December 16 at the Sheriff Center. When: Saturday, December 8, 7:00 p.m.
Blowout! This is the perfect chance for the young guys to get lots of playing time and build up some confidence.